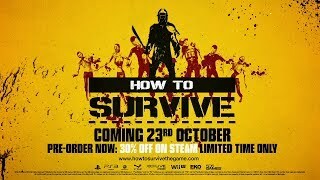 How to Survive puts players in the center of the action as someone who, after an accident, finds themselves on an island amidst a small archipelago off the coast of Colombia ... but there are other inhabitants. In order to make it through the day and night, gamers must learn to fulfill the most basic of needs, such as seeking food, water and shelter, as well as crafting dozens of tools and weapons from fishing rods to Molotov cocktails. There is nothing quite like being surrounded by a zombie-infested archipelago!